About 1,200 Floridians with critical needs will be getting enrollment letters from the Agency for Persons with Disabilities in the next two weeks. Those with critical needs on the agency’s waiting list as of July 1 will be offered enrollment in the Home and Community-Based Services Medicaid waiver. Overall, there are 21,141 on the waiting list as of June 1, according to Melanie Etters, the agency's communications director. The waiver provides personal care for people who need it, along with speech, behavioral and occupational therapy and respite for caregivers. APD Director Barbara Palmer said eliminating the wait list for now means the agency can do some long-range planning. 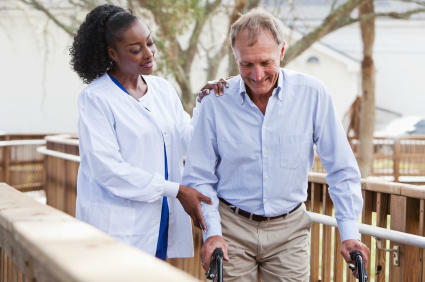 “If we know we have caretakers that are going to reach the age of 70 soon, we can start looking at age 60-65, and anticipate when these costs are going to come,” Palmer said. Palmer also said she wants to track when disabled kids will be aging out of the school system, which can require more services and more expense. The elimination of the wait list is the result of a $20 million allocation approved by Gov. Rick Scott and the Florida Legislature. --Health News Florida is part of WUSF Public Media. Contact Lottie Watts at 813-974-8705 (desk) or e-mail at lottiewatts@wusf.org. For more health news, visit HealthNewsFlorida.org. Gov. Rick Scott announced the state is increasing to 1,600 the number of people with critical needs moving off the waiting list for disability services. Gov. Rick Scott has approved an increase in funding for the Agency for Persons with Disabilities to help about 750 people who are on the the waiting list for the Home and Community-Based Services (HCBS) Medicaid waiver. There are about 22,000 people on the waiting list.